Altitude: 500 and 2,000 metres above sea level. Habitat and Ecology: Parodia microsperma has a wide range, is locally abundant and grows on rocky soils in Monte and Chaco habitat. It is affected by agricultural activities. Description: Parodia microsperma is a compact small to medium-sized, perennial cactus densely covered in dense white, yellow or brown spines and red, central spines, some of which are hooked. The new name refers to the small seeds. It bears blood-red, occasionally yellow flowers in spring. It is an extremely variable species with several local or morphological forms (previously considered independent species). Two subspecies are recognized, the nominate form and subsp. horrida. Habit: It is usually solitary, but can form small clusters. Stem: Spherical when young, but with age it often develops a short cylindrical shape, light green or bluish-green up to (5-)6-7(-10) cm in diameter and 5-20 cm tall (or more). Ribs: 13-21 more or less divided into spiralled, conical tubercles 4-5 mm in diameter 3 mm long. Areoles: 1,5 mm in diameter with white-yellowish tomentum that fade away as they age. Radial spines: (7-)11-13(-30) thin, bristly, white, up to 4-8 mm long. Central spines: 3-4, short, of which the upper three are honey-yellow to reddish-brown or darker with a reddish tip, while the lowermost more long hooked at apex and strong 5-20 mm long, rarely to 50 mm. Flowers: Bright yellow, orange or red, infundibuliform on the plant apex 2,5-3,5 mm long, 40-50 mm in diameter. External tepals spatulate or lanceolate. Pericarpel and tube with wool and bristles throughout. The filaments bear cream-yellowish anthers. Stile white-yellowish bearing a 12 lobed stigma. 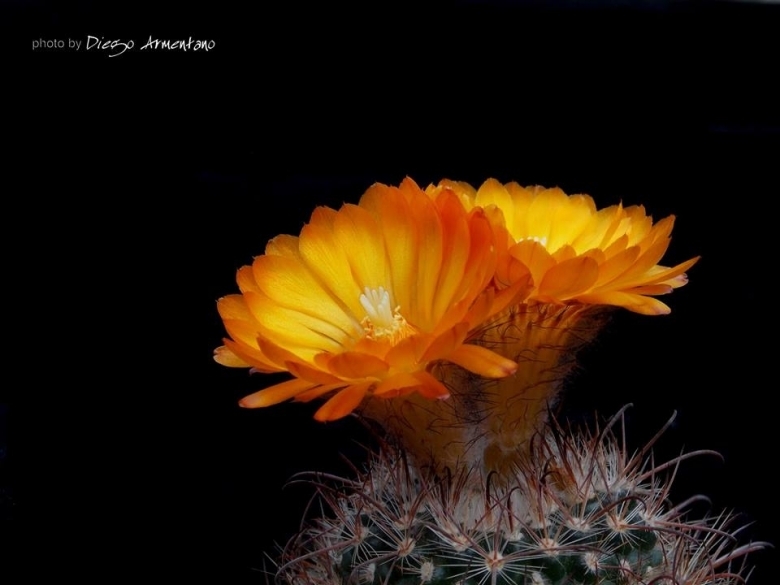 Blooming season: Produces several flowers simultaneously in early summer (while in Parodia maassii they usually appear one by one), the flowers remain open for about three days. Fruit: Nearly spherical to ovoidal about 4-5 mm in diameter, with basal dehiscence. Seeds: Very small, to only 0,4-0,5 mm long including the large white caruncle, seed-coat smooth, brown and shining. 8) Kiesling, R. & Ortega-Baes, P. 2013. Parodia microsperma. In: IUCN 2013. "IUCN Red List of Threatened Species". Version 2013.2. <www.iucnredlist.org>. Downloaded on 04 March 2014. Cultivation and Propagation: Parodia microsperma is relatively easy to grow on its own roots and quite resistant to cultivation. The only things that can kill this plant are cold and overwatering. Nevertheless, it is appropriate to provide adequate growing conditions in order to obtain compact plant with many flowers.